Dream Pod 9: More Commander Tokens Packs Available! Great News for players of our Peace River, NuCoal, Leagueless, Black Talon, Utopia, and Eden factions. The new laser etched and cut color acrylic tokens for the factions are back from Impudent Mortal and ready to order. 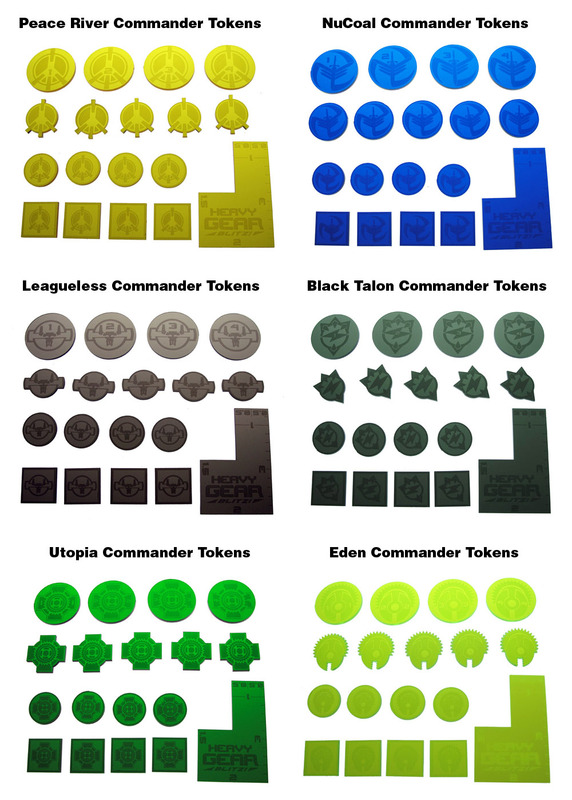 Each Commander Tokens Pack include 17 laser etched and cut color acrylic tokens with the faction logos, plus 1 Heavy Gear Blitz Measuring Tool also in the same color acrylic (see images below for contents). Each Includes four numbered (1 to 4) 40mm round Objective token markers, five close cut 30mm Victory Point tokens, four 25mm round Command Point tokens (C for Command Point and Circle shape), four 25mm square Skill Point tokens (S for Skill Point and Square shape), and one Heavy Gear Blitz Measuring Tool for fast 0.5", 1", 1.5", 2", and 3" measurements. Here is a link to the Dream Pod 9 Online Store Extras Section where all the new Commander Tokens and Status Tokens are available for those interested. Home › Blogs › Robert Dubois's blog › More Commander Tokens Packs Available!